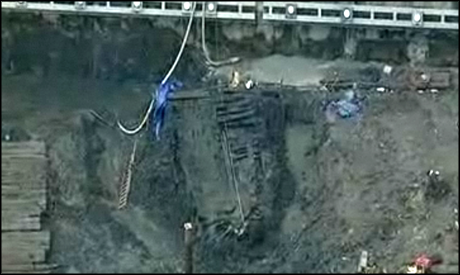 Ground Zero Pirate Ship: The Investigation Begins! Remember that pirate ship they found under the World Trade Center we reported on in July? Researchers gathered many samples and the investigation has now started to reveal the true origins of the ship. The wood samples will hopefully tell us where the ship was built by analyzing the properties and age rings. They are also analyzing various woodworms in the wreckage to glean where the ship might have sailed. The American Archaeologist site is keeping a close eye on the ship and will report findings as they happen. How Did A Ship Get Under The World Trade Center? Construction workers at the site where the World Trade Center once stood unearthed a ship from the 18th Century in New York City yesterday. Crews rushed in to get as much data about the ship recorded before the heat of the sun turn it dust, as well as to ensure that worked continued at the historical site. So did they build the WTC over a pirate’s hideaway, or did Revolutionary New Yorkers find a creative way to dispose of those darn Redcoats? Let us know your craziest theories in the comments!